On January 10, 2017, a rainy night just after a six-inch snowfall, Burrillville (RI) fire, EMS and police responded to Brook Road for a reported dwelling fire. 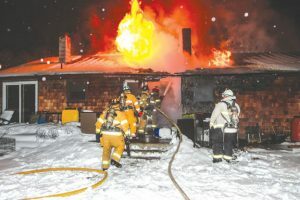 A Burrillville police officer arrived first to find heavy fire through the roof of a raised ranch. The officer performed a primary search and rescued two dogs. First-due companies arrived and went defensive as heavy fire was showing through the roofline. A second alarm was requested for manpower and tankers and the roof failed shortly into the attack. The fire was brought under control in 45 minutes.